It only seems like yesterday that we were driving with the windows down or the Air-conditioning switched on, but the winter driving season is already upon us. Have you ever rushed to go to work last minute, only to be confronted with a severely frost bitten car? The windows thick with ice, doors frozen shut and you haven't remembered to get some de-icer. It’s no problem you tell yourself after half an hour of frantic scraping, heaters blowing full blast in the vain attempt to set off, but when you arrive at your local petrol station all of the de-icer is sold out! A few minutes of your time and MyCarNeedsA.com might just save you a lot of hassle later. It’s not all bad news though, there are a few simple things you can do that save you money as well as time. Starting with the outside; Are the tyres inflated correctly? Most cars have a guide to tyre pressures either just inside the driver’s door jam or under the petrol flap cover. A few PSI difference in tyre pressure can significantly affect performance, handling, safety and fuel economy, so it’s well worth checking. Is there plenty of tread? 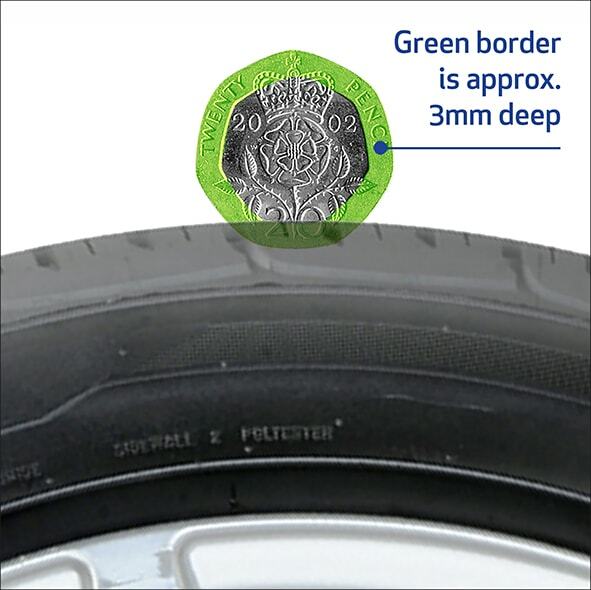 The legal limit is 1.6mm, but its best to be thinking of changing the tyres if they get down to 3mm or below. The 20 pence piece tread depth test can be used as a quick guide. Please see our guide to winter tyres where all is explained. Moving onto the lights, are they all working? If you find that a light bulb needs replacing it can be easy to do yourself, but then again maybe not! We would love to know what some of the car designers were thinking when they designed todays modern cars. Are the wiper blades in good condition? They are usually pretty easy to change but if in doubt ask for help. They can also get easily damaged when trying to simply wipe off the ice from your windscreens without attempting to use and de-icer. This becomes noticeable when the roads have been salted and you’re trying to clean your screen, but your wipers are leaving dirt arches behind. Under the bonnet… SAFETY FIRST… please ensure the engine isn’t running and do not open any fluids if the engine is hot. Check that all of the fluid levels, including Screen Wash and engine oil, are all topped up. Moving onto the interior of the car, are all the warning lights functioning correctly? They should light up when you turn the ignition key to the second position, but then disappear once the engine is running. If any are still visible then please refer to the manufacturers handbook for help. If you have any doubts please do not hesitate to seek help from your local garage. Top Tip: Some motor manufacturers are really friendly and only too happy to help. You can often get wiper blades or bulbs changed for the price of the replacement parts, it’s well worth asking. An ice scraper and small stock of de-icer is well worth having in your glove box, and only cost a few pounds from a supermarket. They are usually much better value than petrol garages or motorway services. Here are some recommendations to carry in the winter months: A litre of the correct engine oil, a torch, mobile phone and charger, spare shoes or boots suitable for snowy conditions, some sweets, a warm coat, gloves and a shovel. Don’t forget to have plenty of fuel onboard just in case you get stuck and need to run the engine to keep warm. Take care and happy motoring from the MyCarNeedsA.com Team.